Hats: you either love ’em or hate ’em. My husband will put on a scully to shovel the driveway, but he’d never consider wearing one into his office during the light of day. And the closest my 15 year-old son will come to a hat is a hoodie. Me? I love hats, and I think I actually look better with a hat than without. The hat featured is one of my favorites. I actually bought this “LIFE IS GOOD” hat for my son when he was in 5th grade. I thought the fluffy ear flaps would look adorable on him and keep him super cozy on freezing winter morning when he had to wait for the bus. I was sure he’d love the huge smiley face on the back. Alas, my boy never took to this hat, so I started wearing it. It’s probably a little too small, but I love it anyway. On this particular day, I also tried wearing a very bright lipstick and while it looked great in the tube, I don’t think I’m able to pull off such a bright shade. It’s good to try new things once in a while though, right? What kind of fashion risks have you taken recently? 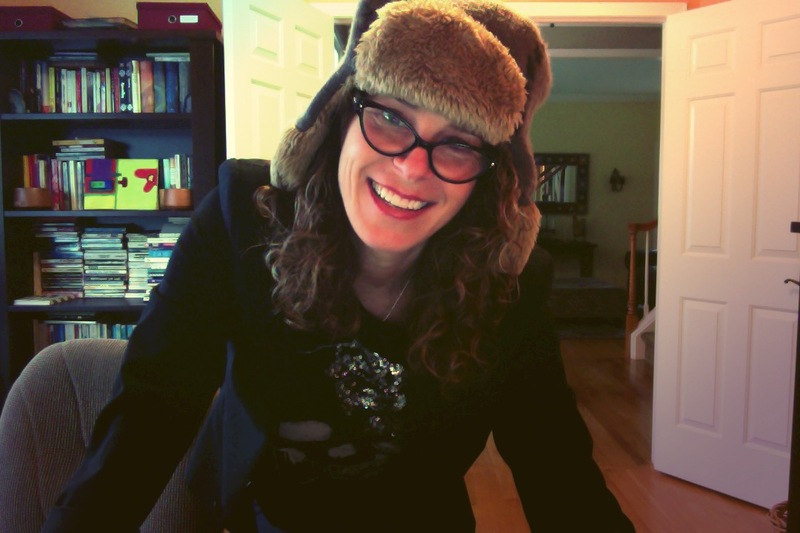 This entry was posted in Hair & Fashion and tagged furry hat, what i wore. Bookmark the permalink. The hat is cool, and I also love the glasses, Renee! Hi D: Thanks for the compliments. I owe you a phone call. There is much to share. Soon, yes? I think the lipstick looks great on you! Love these hats! My boys wore them when they were small:). They’re adorable. Fashion risk. Hmmm . . . trying to lose another 15 lbs. before I get risky. Copout? Yeah, I suppose this hat is considered a boys hat. (((shrug))) Oh well. I love it. and it’s soooo warm. This week it/s supposed to go down to 3 degrees (before the windchill), so I’ll be happy to wear it. Karen, I could totally see you in a straw hat. Yes yes and yes. maybe it’s because of your complexion, but I really could see you rocking one. I adore hats, I also think I look fabulous in them. You are a constant miracle though, braving earflaps with bright pink lipstick. Thank you Val. I’ve been enjoying reading your blog again. Thank you for coming and leaving me a compliment. I love hats too! Infact I have one ,my daughter gave me, and I wear it in the coldest of winter. I treasure it. So Minnesotan-esque. I love it! Our temps are feeling Minnesotan-esque. This week its supposed to get down to 3 degrees. Brrrrr. I love the hats! And from here, the lipstick looks really nice! Not too bright for you at all! I love hats. Sadly, they do not love me. Except for this one Fedora that, if I style my hair just right, and get a bit of a tan, and lose 10 lbs, looks not too bad. From a distance. Oh. And I have a new blog. Because why not?